I can pretty much guarantee that you will never want to hit this particular piñata with a stick! Admittedly, it’s probably more like an art installation than a disposable party prop. 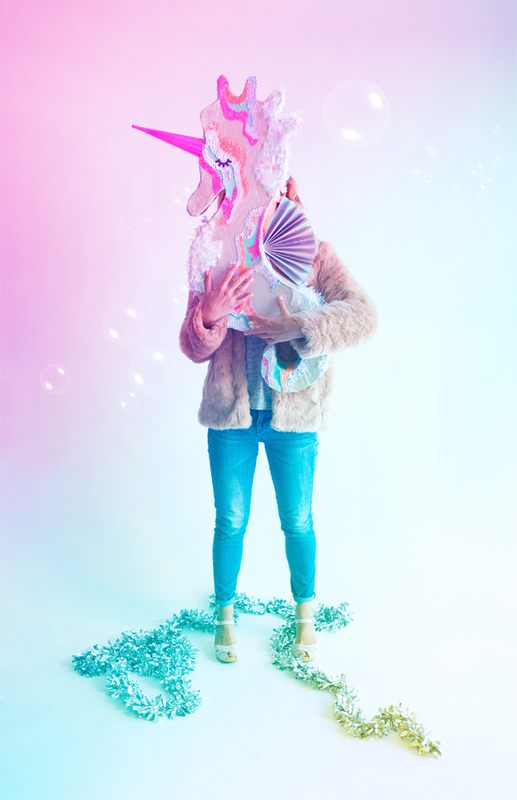 In fact, we’ve all been joking around the studio that it’s kind of like “Piñata Couture”. 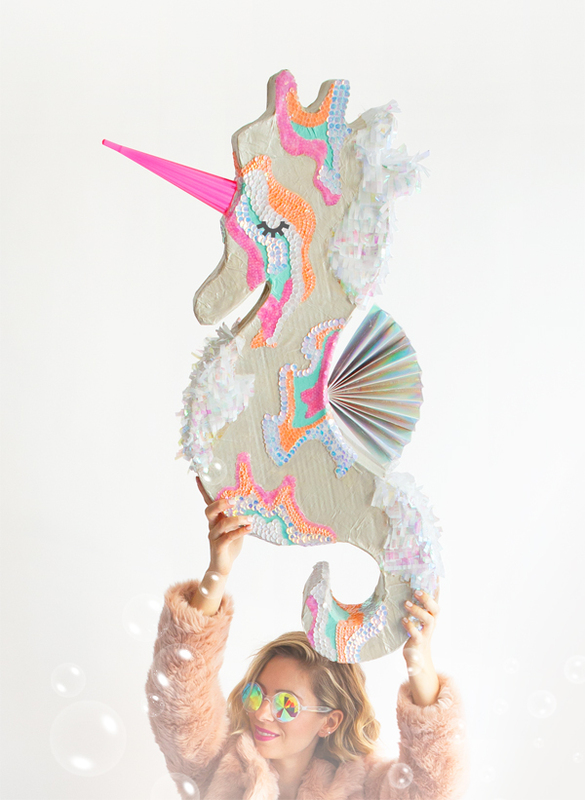 Yes, creating this beautiful creature takes time and patience but in the end you’ll have something CRAZY GORGEOUS that you’ll be dying to show off at your next party! Tools and Materials: Seahorse template, ‘seahorse eyes’ design, white cardstock, cardboard, strong tape, newspaper, paper mache glue ( 1 cup of flour + 2 cups of water, heat up a little bit until it’s all mixed up), white spray paint, sequins, white tissue paper, iridescent cellophane, iridescent cardstock, acrylic paint, neon pink plastic champagne glass, printer, scissors, ruler, x-acto knife, pencil, hot glue gun, paintbrush. Step 1: Download and print out the template then take to Office Depot (or similar) to get it photocopied to 30 inches long. Step 2: Cut out the seahorse. Step 3: Trace the seahorse onto the cardboard. Step 4: Cut out the seahorse from the cardboard (repeat step 3 and 4 for the second seahorse part). Step 5: With a ruler trace a long strip onto cardboard and cut out. Make as many as you need to go around the seahorse ( we made them 4 inches wide). Step 6: Bend the cardboard strips around the form of the seahorse. Step 7: Tape together the strips and the seahorse, both sides. Step 8: Paper mache the entire seahorse. Step 9: Spray paint it white. 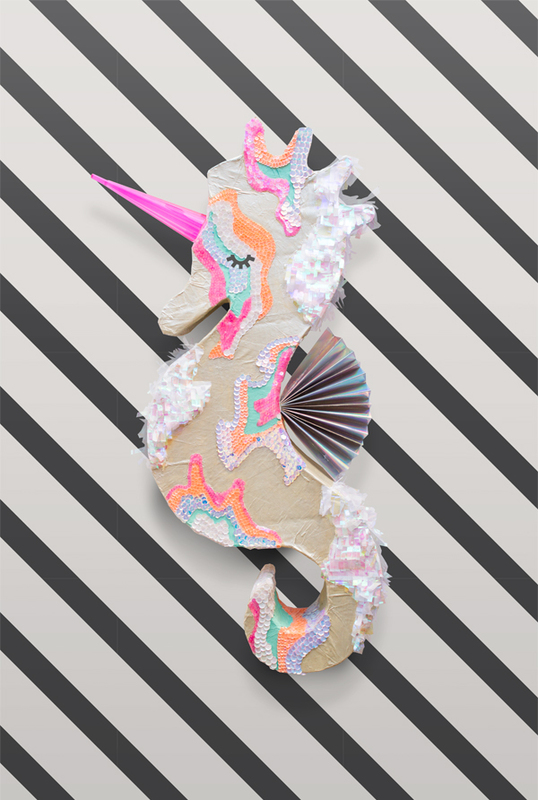 Step 10: Start drawing random shapes on to the seahorse and designate areas for sequins and for fringe (see our images for inspiration). Step 11: With a glue gun place the sequins onto the piñata. You can choose your own color combinations. Leave some segments blanks so that you can fill them with a paint color. Step 12: Fringe the white tissue paper and the iridescent paper, attach it to the piñata with a hot glue gun. Step 13: Paint the rest of the piñata with acrylic paint. 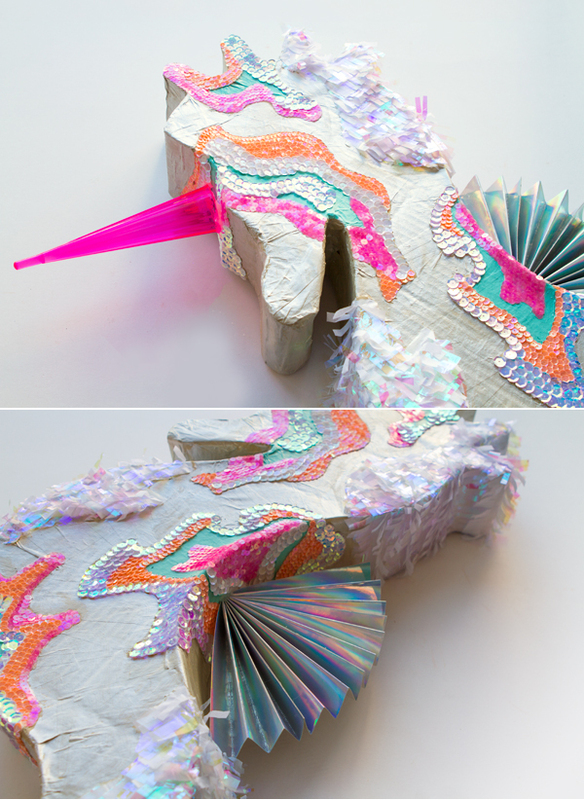 Step 14: Fold the iridescent cardboard paper like a fan, attach it to the back of the seahorse with a hot glue gun. Step 15: Attach the plastic champagne glass with hot glue gun. Step 16: Print out the ‘seahorse eyes’ onto white cardstock and cut out and attach to piñata. I need to make this RIGHT NOW. Holy heck, this is amazing. I wouldn’t want to wreck this one either! It’s a beautiful piece! This pinata is so gorgeous! You did an incredible job! Wow! How did you know I am planning a mermaid bday party in a month and need this in my life!! I know a 5-year-old who would die….. So gorgeous! I love your pinata designs and this one takes the cake. Also, can we talk about the models adorable pink fur coat and cute clogs? Well done! Psychedelic-silly-rainbow-super-fun party time!!! 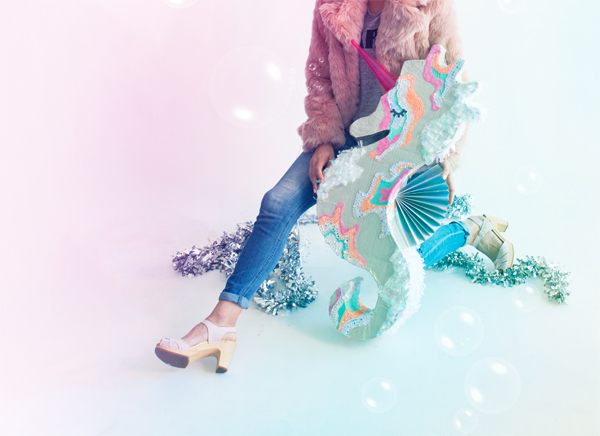 I love the way you styled the seahorse pinata. Oh my! I need that piñata and those sunglasses. Like no joke. Right now. That piñata is making me do happy. Really where are those glasses from?